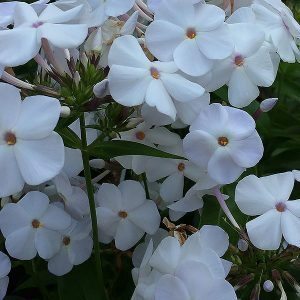 We have always liked Phlox and now we have found a new variety named ‘Minnie Pearl’ that is one of the best white flowering varieties we have grown. Phlox ‘Minnie Pearl’ is one of those natural hybrids that from the eastern states of the USA. Fragrant clean white flowers, good glossy green foliage, and it is fairly disease resistant as well. This is a low growing variety by Phlox standards, it will reach between 20cms (12 inches) and 40 cms (15 inches) in height and is well suited to growing in containers. It flowers early in the season, spring to early summer, and will spread overtime to form a nice clump. Flowers are attractive to butterflies and bees and this tough little Phlox copes with hot dry conditions, so it will grow happily in full sun, as long as the soil is humus rich. Best planted in a well prepared soil, dig in some well potted compost before planting. Ensure that the drainage is good. Plant, water in and them mulch around the plant with pea straw or similar. Although this is an easy care perennial, iPhlox ‘Minnie Pearl’ does appreciate a little TLC. Light pruning after flowering will keep the plant compact. An annual topdressing with some cow manure and compost before renewing the mulch will be beneficial. Occasional applications of a seaweed fertiliser, vermicaste tea or a slow release general purpose fertiliser will also aid growth.